It’s been a tough couple of weeks for firefighters in Walton County and Social Circle. There have been two fire truck wrecks at nearly the same spot. A Social Circle firefighter remained at Grady Memorial Hospital’s ICU, while three other firefighters are at home recovering. The Georgia State Patrol is examining both wrecks to see if it was a terrible coincidence or if roadway improvements might be needed. 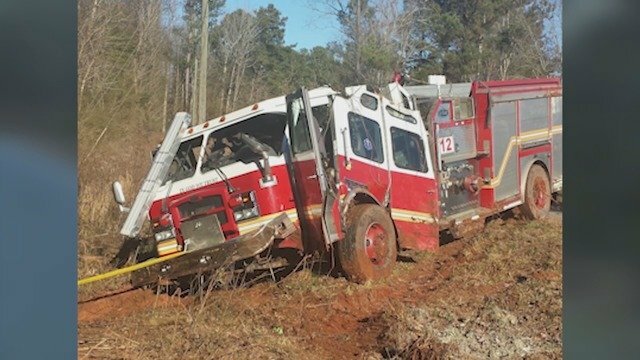 Social Circle Fire Department Chief Ken Zaydel showed FOX 5 News the spot on Hawkins Academy Road where last Friday afternoon a Social Circle Fire Department truck crashed when responding to a structure fire about a quarter mile away. A week earlier a Walton County Fire Department truck crashed at nearly the same spot, about 40 feet away. “It’s rare, it’s almost unheard of,” said Chief Zaydel. He said Georgia State Patrol’s SCRT, Specialized Collision Reconstruction Team, is comparing notes on the two crashes to determine if it was just a terrible coincidences or more needs to be done for safety. Walton County’s Fire Rescue Fire needs answers too. “The weight of a fire truck, with water pushing it and everything, it’s hard to get control of a firetruck once it gets off the edge of a road,” said Chief Kevin Haney. In total four firefighters, two from Walton, two from Social Circle, were injured. One Social Circle firefighter is in serious but stable condition at Grady Hospital’s intensive care unit. “Pray for the family and they need the support,” said Chief Zaydel. Social Circle and Walton County Fire chiefs both told FOX 5 News they put reserve trucks back in service and that firefighters are pulling extra duty to fill the gap left by the injured firefighters. “There’s been no loss of service trucks are still staffed every day we’re still answering calls. We’re a big family, everybody’s willing to step up to help each other out,” said Chief Zaydel. One woman who lives near the spot where the two fire trucks crashes occurred said in the last few months there have been about a half dozen accidents there. Anyone who would like to help the firefighters out can click here.